A complete shoulder luxation (dislocation) is almost always the result of a trauma (such as when playing football, skiing, etc.). Patients suffer excruciating pain and it is impossible to move the arm. Urgent hospitalisation is required and a reduction must always be performed. When we talk about subluxation (partial luxation) there is a sense of insecurity and pain when performing certain movements, such as reaching for an object. It feels like the shoulder is going ‘to pop out of the socket’. Most cases of luxation occur at the front (anterior) figure 3a+b, and are rather rare at the rear (posterior) as in an epileptic fit. Usually trauma preceding a fall on to the outstretched arm or direct trauma to the shoulder. 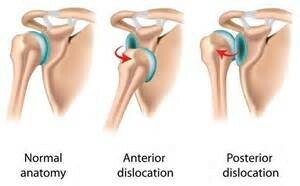 If the shoulder is fully dislocated this may cause damage to the labrum - the capsule and ligaments. We call this a Bankart lesion. The bone may also be damaged with an indentation fracture on the shoulder ball (Hill-Sachs lesion) or a fracture caused by the glenoid being ripped off (Bankart fracture). If the first luxation causes damage to one of these structures the chance of reluxation is significant. The younger the patient, the greater the risk. The trauma in the case of a second of third luxation is often ‘milder’ than in the first. In rare cases a luxation could also damage the nerves around the shoulder. This is usually temporary but could drag on for months. Some people genetically have more elastic ligaments and connective tissue. We call this hyperlaxity of the joints. Naturally, not only the shoulders, but also other joints are susceptible to hypermobility (such as ankle instability). First of all the patient’s complaints and history will provide a lot of information. As far as technical tests are concerned, X-rays and an NMR arthrogram are usually necessary. If there is any doubt regarding nerve injury an EMG (Electromyography test = test that can measure nerve activity) will be performed. This test will only be conducted several weeks after the trauma. A complete dislocation must be treated as quickly as possible. An examination must be carried out to establish whether any injury has been caused to the nerves or blood vessels in the arm. An X-ray is required (especially the first time) and will confirm the diagnosis. With a calm patient or with recurring luxation the reduction can begin in A&E without any anaesthetic. However, in most cases the doctor will decide to carry out a controlled repositioning in the operating theatre under a brief anaesthetic. Following the reduction the arm will be immobilised, usually with an adduction bandage or a sling. Physiotherapy is usually needed to regain strength and movement. Additional therapy will depend on the subjective feeling of stability, patient’s risk behaviour and age. It is clear that a luxation of the shoulder is accompanied by severe obligate injuries in the shoulder joint. When the shoulder dislocates it always tears the capsule and the labrum at the edge of the socket (this is called a Bankart lesion) and there is always a fracture in the bone of the ball (Hill-Sachs lesion) and/or the socket (Bankart bone lesion). Less common, and mainly occurring in elderly patients, the bone may also break off or the muscles may tear (rotator cuff). Not all the damage in the joint will heal by itself. This means there is always permanent damage following a shoulder dislocation. Further treatment after the acute phase will also be discussed with you at the next consultation. The patient’s age and sporting or professional activity will influence the further treatment options. With a first luxation a conservative approach is usually adopted, consisting of a brief immobilisation period, followed by physiotherapy. It is clearly explained that obligate damage to the joint is present that makes a second (and third) shoulder luxation likely (95% chance of a relapse shoulder luxation among young, 20-year-old athletes). Among middle-aged patients (30-40 years) the risk of recurring luxation decreases and the preference is for conservative treatment. Among older patients (> 55 - 60 years) the muscles of the shoulder (rotator cuff) may also tear or break, which could result in pseudo-paralysis of the arm (the arm can no longer be raised). Muscle repair (rotator cuff repair) may be proposed taking the patient’s age into account as well as his or her vitality, the pain and functioning of the shoulder. (See rotator cuff repair). A shoulder prosthesis may also be recommended (see shoulder prosthesis). There are two types of procedures to treat shoulder instability. Arthroscopic Bankart repair (keyhole surgery) and Latarjet open shoulder stabilisation. 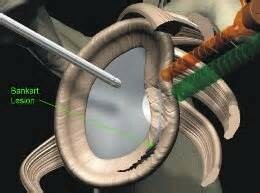 Arthroscopic Bankart repair: The torn labrum is stitched back to the glenoid in the shoulder via keyhole surgery. Several small bone anchors are used for this fixation. The patient usually stays in hospital overnight; after the procedure the patient must wear an adduction bandage for two weeks or so. Intensive rehabilitation - with the help of physiotherapy - is needed afterwards. A three to six-month rehabilitation period is required. Latarjet or open shoulder stabilisation: With severe bone defects/multiple luxations it may be necessary to perform an open shoulder stabilisation. A bone block is inserted in front of the glenoid to create an additional bumper. You will discuss the type of procedure necessary in your particular case with your doctor.